Can Mkhitaryan turn around Arsenal’s fortunes? London (AFP) – Henrikh Mkhitaryan will have his work cut out to reverse Arsenal’s flagging fortunes, after joining the Gunners from Manchester United on Monday in a swap deal that saw Alexis Sanchez move in the opposite direction. The 29-year-old had a difficult spell under Jose Mourinho at Old Trafford, but Arsenal manager Arsene Wenger will be hoping the Armenian can rediscover the form he showed at Borussia Dortmund that led to him signing for United for a around £30 million in 2016. Will Mkhitaryan get a starting place? 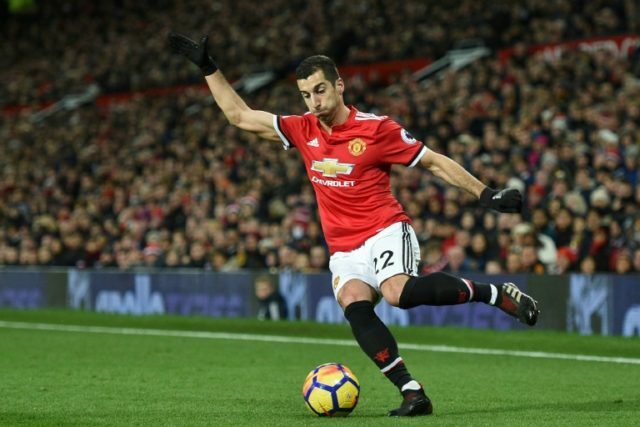 Mkhitaryan struggled to nail down a spot in United’s team despite arriving from Dortmund with an excellent reputation after three strong seasons in Germany that produced 27 goals and 34 assists in all competitions. Sanchez’s departure leaves Mesut Ozil as Arsenal’s creator-in-chief. Aaron Ramsey and Jack Wilshere have both been plagued by injuries in recent years, while Alex Iwobi has failed to consistently impress despite being given a lengthy run in the side. Mkhitaryan looks set to slot in alongside Ozil and behind striker Alexandre Lacazette if he finds anything like the form he showed in the Bundesliga and before that with Shakhtar Donetsk. Is he a replacement for Sanchez? Although Mkhitaryan is moving to London in a switch with Sanchez, he is not a direct replacement for the Chilean international. Sanchez provided ruthlessness in front of goal and the ability to run at defenders, while Mkhitaryan’s strengths lie with his passing and creativity. Sanchez has scored 60 Premier League goals in 122 appearances, while Mkhitaryan managed just five in 26 games at United. But the Armenian leads Sanchez in other areas, making more assists and passes per game. Mkhitaryan completes 51.47 passes a match compared to Sanchez’s 48.16 according to statisticians Opta, suggesting his style of play will fit in with Wenger’s preference for passing football. Mkhitaryan does have more goals in him too, having scored 23 in 78 Bundesliga appearances before finding himself deployed in a variety of positions by Mourinho at United. Do Arsenal need another attacking midfielder? Wenger has been criticised in recent years for buying too many attack-minded midfielders and ignoring other supposed weaker spots in his team. With close-season signing Alexandre Lacazette struggling to find the net with regularity — he scored his first league goal since December 2 in Saturday’s win over Crystal Palace — Wenger will be hoping Mkhitaryan can bring the best from the French striker. The 68-year-old Frenchman is confident he can start Mkhitaryan with the likes of Ozil, Ramsey and Wilshere. “Just play the good players, they can always play together,” he said. Can he help Arsenal return to the Champions League? Arsenal fans expect their team to be challenging for the Premier League title, but the stark reality suggests that they are some way from matching Manchester City and even United. Just returning to the Champions League after missing out this year for the first time since 1998 is still a formidable task, with Arsenal currently lying sixth. If Mkhitaryan can quickly strike up a relationship with Lacazette and Ozil then Arsenal could start to close the gap, but they are probably still another top signing away from challenging for the biggest titles. Mkhitaryan’s former Dortmund team-mate Pierre-Emerick Aubameyang has also been heavily linked with a move to north London, though, and perhaps reuniting the pair could prove to be exactly what Arsenal need to close the gap on the rest of England’s ‘big six’.